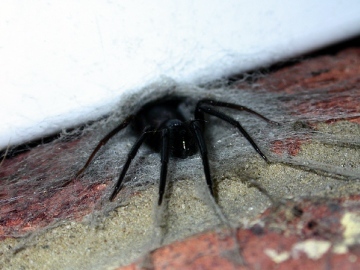 The 'Green-fanged tube web spider' Segestria florentina would appear to be restricted to southern Britain and used to have a largely coastal distribution, though it is increasingly being found inland and appears to be becoming more common generally. It can be locally abundant in parts of the South East. Females and immatures may be encountered when their web is disturbed or destroyed. Adult males may be encountered on their wanders, when they may find their way into houses on the search for a female. It is largely sedentary, and may be under-recorded within its range for this reason. 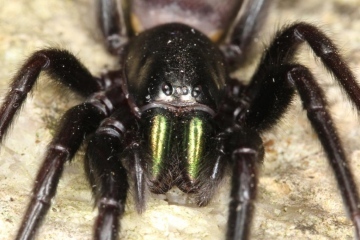 The chelicerae (‘jaws’) have a characteristic metallic green iridescence which distinguishes this species from other Segestria species. 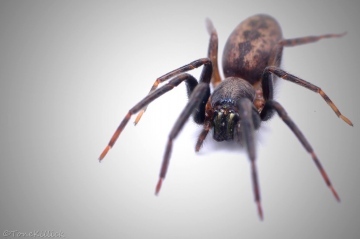 This can sometimes be seen with a torch at night while the spider is sitting in the entrance to its tube-web. The general body shape of Segestria species is one adapted for tube living; elongated and cylindrical. When at rest the front three pairs of legs usually point forward, the rear pair back – another adaptation to tube life (they can run forwards much quicker than they can reverse). Adult Segestria florentina are very dark spiders. The males are black, though hairs on the abdomen may make it appear grey. A faint pattern is sometimes visible on the abdomen; a longitudinal line of large joined spots (like that seen in other Segestria). This pattern is usually much more visible in juveniles, and confusion is possible between juvenile S. florentina and other Segestria species. Females are dark brown to black, and again a pattern may be visible on the abdomen, but more often than not it is uniformly greyish. 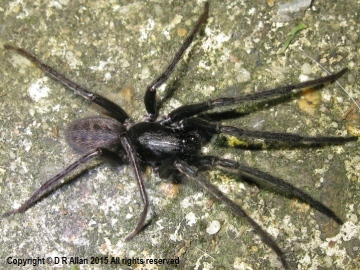 Adult Segestria florentina are significantly larger than the other Segestria species found in the UK, with female body length sometimes exceeding 20 millimetres (compared to the maximum of about 10mm for the common and widespread S. senoculata and 14mm for the S. bavarica, a rare spider restricted to coastal regions in south west Britain and North Wales, where it can be found in cracks within rock outcrops or old walls). Indeed, it is one of our largest spiders, though they have a smaller leg span than spiders of a comparable body size (e.g. Dolomedes). Like other Segestria species, S. florentina spends most of its life in a silk-lined tube, usually located above ground level, in a suitable hole or crevice. These retreats are usually encountered in walls, between bricks or tiles, or planks of wood. They have even been known to set up home in rolls of fabric. There may be more than one entrance to the retreat, where the opportunity presents itself. In common with other members of the genus, the entrance to the retreat is surrounded by radiating silk threads, like the spokes of a wheel. These act as trip-wires, alerting the spider to passing invertebrates that it darts out to grab and drag back into the retreat. On encountering webs of Segestria, the best way to see them is either with a torch at night, when they come to the entrance and wait with their front legs resting on the surrounding threads, or by tickling the radiating threads around the entrance to the tube-web, to fool the spider into rushing out after prey.